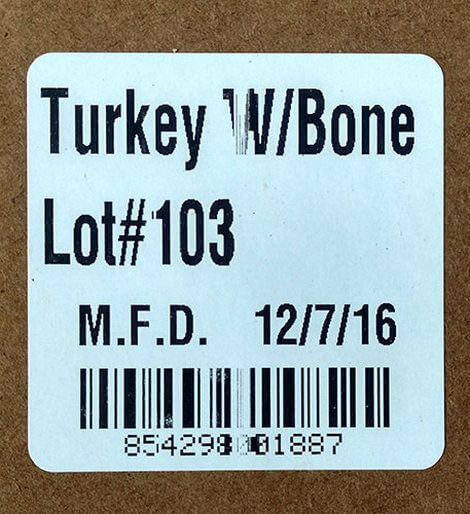 January 17, 2017 — Blue Ridge Beef of Eatonton, Georgia, has announced it is voluntarily recalling one lot of its Turkey with Bone raw frozen product due to its potential to be contaminated with Listeria monocytogenes. And there is a risk to humans from handling contaminated pet products, especially if they have not thoroughly washed their hands after having contact with the products or any surface exposed to these products. This recall was initiated as a result of an FDA inspection and sampling of the product. This recall is being made with the knowledge of the US Food and Drug Administration. Consumers who have purchased the above lot of Blue Ridge Beef Turkey with Bone raw frozen product are urged to stop feeding the product and return it to the place of purchase for a full refund. Or dispose of the affected product immediately.